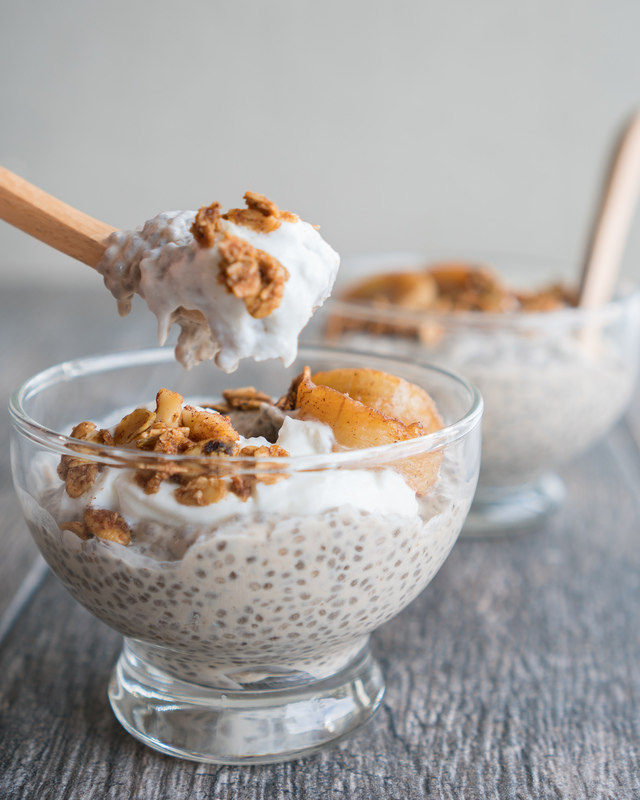 Chai Coconut Chia Pudding. Like a creamy chai tea latte with that signature warm spice profile all suspended in chilled chia pudding form. Lightly sweetened with honey and just a bit of vanilla, with those crunchy little pops of soaked chia seeds in every bite. And to cap things off, a subtle hint of tea flavor peeking through a rich, velvety coconut milk and almond milk pudding base. Now that might be decadent enough in itself, to just end things right then and there. Dig in with a spoon and call it good. By the time the tea is done steeping in the sweet, honey thickened milk I am ready to just sip it straight from the sauce pot. And you could totally do that, by the way. At that point you’ve made yourself quite the artisan little stovetop latte by simmering the black tea and spices in milk and gently cooking honey into it. But today we aren’t stopping there. Holster your spoons (just momentarily, I promise you can bust them out again soon). There’s more to come. Today we are taking things over the top by adding a layer of hot, caramelized bananas fresh from the pan and a sprinkle of crunchy, sweet granola on top for even more texture. And maybe a dollop of Greek yogurt to amp up the protein content and make it into a whole breakfast parfait situation. Because, why not? I don’t know about you, but breakfast (or its close cousin, brunch) is my favorite meal of the day. I take it as an opportunity to shift things into dessert mode and start my morning with something sweet. But sometimes when I wake up, I am in a rush to start the day (read: already behind on something I need to do). So I opt to prep something more convenient that doesn’t take as much time (or patience) as say a slow Saturday kind of baked French toast casserole, or a luxuriously lazy Sunday morning pancake stack. If I’ve just rolled out of bed, chances are good that I am hungry. Full on morning monster mode. I just need all the coffee and some food-based sustenance. Preferably as quick as possible. And this is why I love prep-ahead breakfasts. They make my life easier and by default, make me infinitely happier. More time to sleep in and snooze a bit longer. 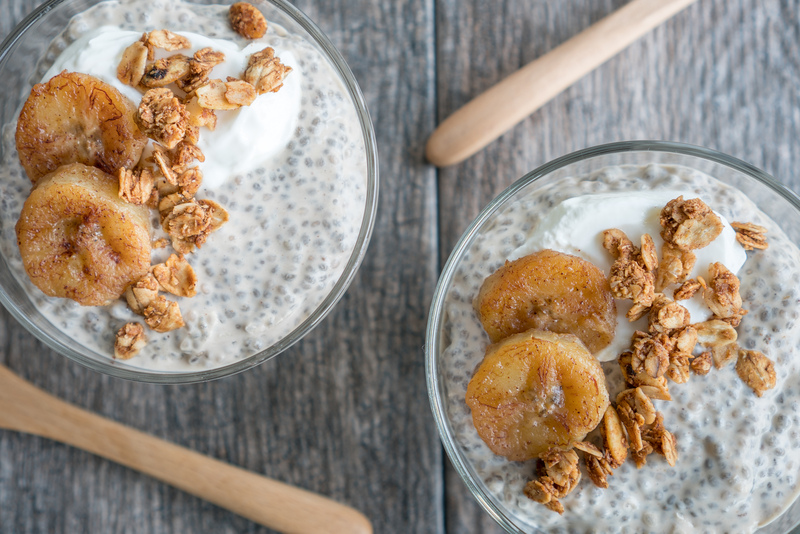 Greek yogurt loaded overnight oats, slow cooker oatmeal made in humongous quantities that last all week, and chia pudding parfaits. These are all winners in my book based on the prep-ahead principle alone. You can make batches ahead of time and let them sit pretty in the fridge. There they will be waiting, ready for you to crack open and add your chosen toppings to in the morning. I like to keep the pudding base simple and lightly sweet, something that adapts well to my temperamental taste buds. One that can accommodate sudden and changing food cravings. So lightly flavored tea, vanilla, honey, and cinnamon fit the bill nicely for this sort of thing. I can swap the fresh fruit that’s added on top, mix in Greek yogurt, build a granola parfait, stir in some jam, add a spoonful of nut butter, or layer in a bowl with toppings AND a smoothie for a big nourishing breakfast bowl. Whatever you’re in the mood for having that morning. When I visited my parents a few weeks back, I was shocked to see that my dad was diving spoon first into chia pudding for breakfast. Healthy, omega-packed, fantastic source of fiber, protein filled, CHIA SEEDS were being happily devoured by my Brussels sprout hating, asparagus shunning father. Without any complaints, I might add. Miracles, I tell ya. They do exist. As it turns out these tiny seeds pack a powerful punch when it comes to health benefits. They are anti-inflammatory, can help out with lowering blood pressure, and have lots of fiber (which can help with satiety, weight loss, and overall digestive health). Believe it or not these little seeds are super easy to incorporate into smoothies, salads, and puddings. In my opinion, they don’t really have much happening in the taste department. No strong flavor or weirdness to cover up and camouflage. 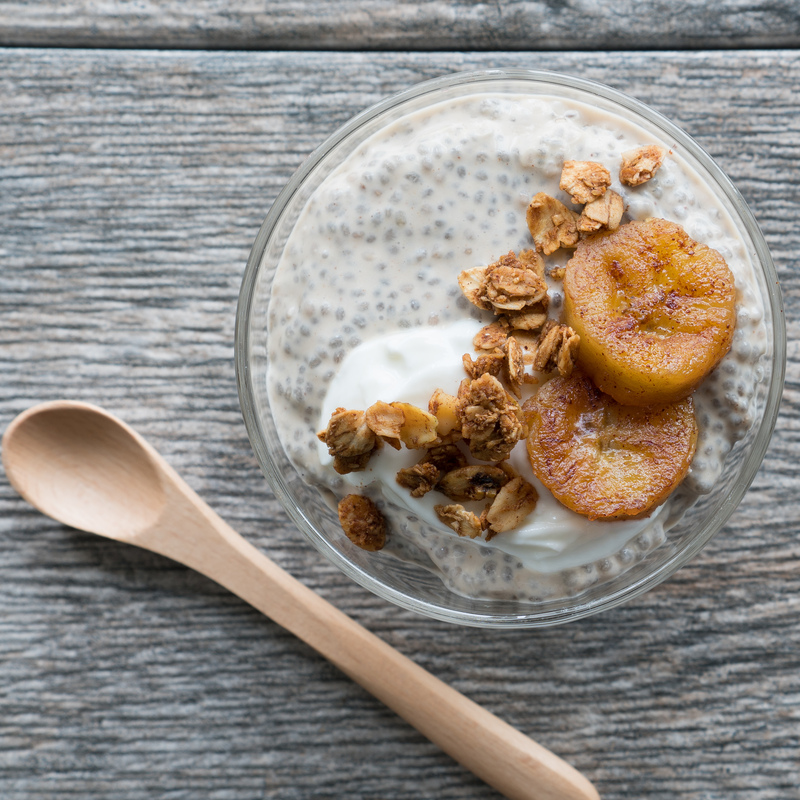 Chia seeds give the pudding its body and substance. When they come into contact with liquids (like water, juice, or milk), they retain some of their crunch while also sort of gelling up. After some time they start to absorb the liquids around them and take on a new texture. Meaning you don’t have to add flour, cornstarch, or eggs to help you thicken this pudding. You don’t even have to cook them or grind them up for them to do this either. If you wanted to skip the steeping of the tea, you could just do what my parents do and shake them up with milk and some stevia drops, pop them in the fridge overnight, and eat them in the morning. This is just a little fanciful version of that already awesome base pudding recipe. One that combines my love of lattes with my obsession desserts. Feel free to explore the swaps I’ve listed in the recipe card below to make it work for you and your lifestyle. If you aren’t a fan of honey you can swap for equal amounts other sweeteners. If you and sugar aren’t the best of pals, then you might find that stevia is an awesome alternative. Using liquid stevia drops rather than the powdered or granulated versions will blend more easily into the mix. Change the fruits according to what you like best and personalize your toppings. Granola, candied nuts, raw seeds, shredded coconut, or even puffed rice or millet cereal all add that beloved crunch factor to keep you and your mouth happy as can be. Just repeat the layers until you’ve got yourself a tall, protein-packed stack happening. The no frills approach (also known as sneaking bites straight from the fridge) works great too. MAKE THE PUDDING BASE: Add coconut milk and almond milk to a small pot on the stove, bring to a boil. Once it has reached a boil add the honey and vanilla and stir until melted in. Turn down to low heat, add chai tea bags, cover and simmer for 10 minutes. Add a pinch of salt and cinnamon and stir until well incorporated. Remove from heat and carefully remove tea bags from hot mixture, be sure to squeeze out all the extra liquid from the tea bags for maximum flavor (using tongs with help do this while protecting your fingers from the heat). Discard tea bags and stir in chia seeds. CHILL PUDDING: Pour into glass dishes, cover, and refrigerate for at least a few hours. Overnight works best to get the most ideal consistency. The longer you are able to let it sit in the fridge the thicker the consistency will get. You can test if it’s “ready” by tilting the container side to side and seeing how much the pudding slides back and forth. It’s best when it hardly budges when tipped. TOP AND SERVE: Add toppings for texture (like granola, coconut, chopped nuts, seeds) or to make it more filling and substantial (like fruit, jams, purees). Layer with Greek yogurt, fruit, and granola to make a filling high-protein breakfast parfait. EASY CARAMELIZED BANANAS: Cut a banana into ½” slices. Add ½ tbs coconut oil to a small pan over medium heat. Pan fry until lightly caramelized on both sides, flipping once. Dust with cinnamon and add a drizzle of honey or coconut nectar and flip around until well coated. 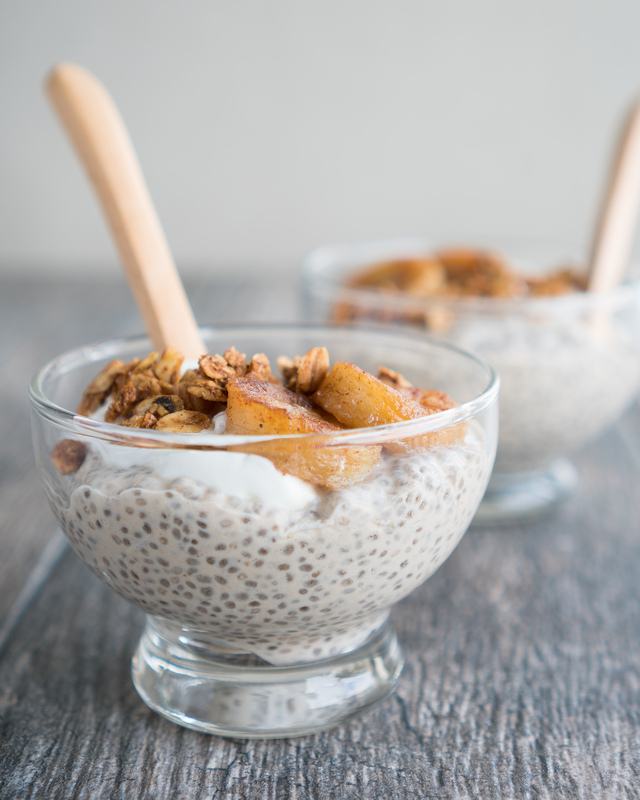 Serve hot on top of chilled chia pudding. *I used full-fat coconut milk and then cut it with lower fat almond milk but you could use all coconut milk with no almond milk, or swap for light coconut milk as preferred. This will just alter the texture slightly. **Swap for equal parts maple syrup, coconut nectar, coconut sugar, or brown sugar as preferred. Alternately you could use liquid stevia drops to keep it sugar-free. Disclaimer: This post may contain Amazon affiliate links. You found me out, Lynne! I wedged the “coconut” milk descriptor into the title in between the two words chia / chai because putting them together made it look like I had misspelled one or the other haha! Omg this looks amazing! I absolutely adore Chia Seeds. I put them on anything I physically can lol! Awesome recipe. I will have to try it. Thank you for the sweet comment, Alethea! I’m right there with you on the chia seed love affair. It’s hard not to sprinkle them on EVERYTHING! They’re just so cute and crunchy! Those caramelized bananas :O :O :O Looks SO good. It’s dinnertime and yet here I am craving this. Haha! Will definitely pin to my breakfast board! Thanks, Allie! 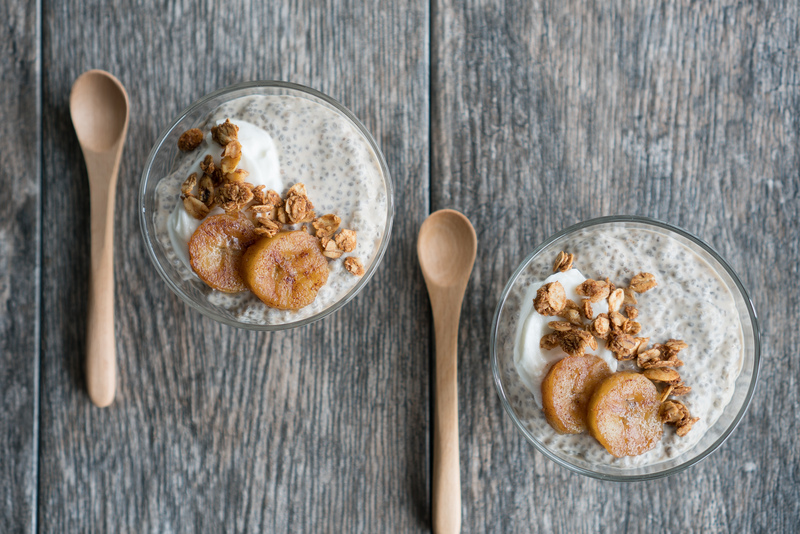 I love bananas foster so anytime I can add a little caramelized banana action to some yogurt or chia pudding, I am ON IT!